While it’s tempting to automatically turn on your air conditioner when the weather gets a little warmer, it’s not the most efficient way to battle the early days of summer. Before you commit to months of increased electrical bills consider some of these simple, economical ways to keep the temperature in your home down, while still being comfortable. Fans do use electricity but they use far less than central or wall unit air conditioning. There are many different kinds of fans you can incorporate into your home design to help keep your home cool, like ceiling, window and portable fans. Many homeowners overlook the advantages of ceiling fans when designing a new home. It is much easier to have the electrical outlets installed during a new home construction then down the road. With the wide range of styles and materials available a ceiling fan can add great appeal to your interior design while reducing your energy costs in the summer by up to 40%. When you select a ceiling fan keep in mind that the fan needs to fit the size of your room in order to be most efficient and at least 7 ft from the floor to ensure safety, comfort and performance. If you don’t have the wiring for a ceiling fan you can select from a wide range of window fans, which you can place vertically or horizontally in your window to provide instant relief and help draw hot air out. 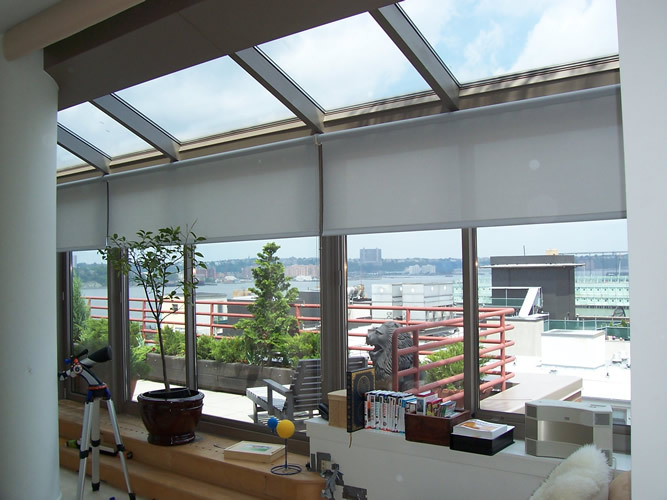 Solar shades and window treatments are a perfect, energy-efficient solution for covering windows and sliding doors so your home stays cooler. By updating your window treatments you will be giving your entire home a stylish and energy-efficient makeover. Cross-ventilation is simple, yet sometimes overlooked solution for home cooling. If you are designing a new home be sure you work with your architect and builder and have them go through window placement to sure it is the most energy-efficient and aesthetically appealing. At night, when the air is cooler, make sure the windows are open to let the outside air flow through. Remember your parents telling you to turn off the lights when you leave a room? They were right, but in the summer you should consider turning off the lights when you are in the room as well. Make the most of daylight and only turn on lights when really necessary. If you haven’t already switched to fluorescent or compact fluorescent lighting you’ll want to, because these lights are much cooler than incandescent or halogen lights. These are all easy and effective ways for you to cool your home without using the air conditioner. It will not only cut down your electric bill, but you’ll be helping the environment as well. So before you switch your thermostat to cool, try and see if any of these tips will make you comfortable enough during late spring and early summer.